Remove the bolt that secures the LoPro fitting on the right side of the foot bar. 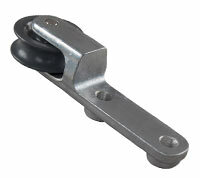 Place the Remote Bracket (a) on top of the foot bar with the pulley facing the stern of the craft. Line up the holes, insert the 2.5" bolt, with a washer on both ends, and tighten. This fastens the bracket in front and to the side of the rower. 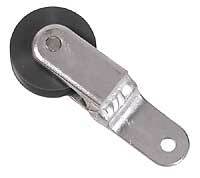 Which Intermediate Pulley used will depend on which type of LoPro you have on the rear yoke. The older cast aluminum LoPro has the word “NRS” molded into the top. The newer hot-forged LoPro has “NRS FORGED” stamped into the top. Remove U-bolt from the LoPro fitting on the upper right side of the rear yoke. Replace with the oversized U-bolt. If you have the older cast aluminum LoPro you will attach Intermediate Pulley (b) to the inboard arm of the U-bolt. If you have the forged LoPro, place Pulley (c) over both arms of the U-bolt. Tighten nuts. Place the Anchor Mast (d) in the center of the yoke at the stern of the craft. Fasten in place with the oversized U-bolt provided, on the top bar of the yoke. Periodically check the tightness of all bolts.